When we were working our way out of six figures of student loan debt I loved hearing stories of people who had made it to the other side of the daunting debt hurdle. I still love hearing debt payoff stories! Today Jen from Frugal Millennial is sharing her story! When I finished grad school, I found myself underemployed and buried in $75,000 of student loan debt. I had always known that I would have debt, but I thought I would be a making a lot of money. I was in for a rude awakening. My first full-time job paid so little that nearly 50% of my income was going toward my student loan payments. I didn’t know what to do. I briefly considered switching to an income-based repayment plan until I realized that this would mean paying over $100,000 in interest alone. Luckily, a wise friend lent me a copy of Dave Ramsey’s book The Total Money Makeover and I was intrigued by the debt snowball concept. After my husband and I got married, we decided to pay off our combined $117,000 of student loan debt in just three years. Paying off debt isn’t easy. It requires hard work, discipline, and sacrifice. It’s a challenge now, but it will absolutely be worth it when we’re 100% debt-free. We’ve paid off $77,000 so far and here are the strategies we’ve used. Living with parents or in-laws is sometimes a controversial choice, but it’s undeniably one of the most effective ways to cut costs. My husband and I live in an overpriced suburb, and even renting a tiny studio apartment would cost at least $1,000 per month. Living with my parents allows us to save thousands of dollars each year. That money goes straight to extra payments on our loans. I still drive the same car I’ve had since I was 20. It’s 18 years old now, full of rust, and the heat barely works. It’s usually making some kind of bizarre noise and it’s what most people would consider embarrassing. It does need repairs more often than a newer car would, but I’m still able to save a few hundred dollars every month by not having a car payment. My car insurance, tabs, and other car-related expenses are dirt cheap as well. My husband was also driving an old car up until a few years ago when the transmission in his car died (again). Instead of spending thousands to replace it when the car already had 200,000 miles on it, we decided to buy a used smart car. We saved up $4,000 as quickly as we could and paid cash for it. A smart car certainly isn’t his dream car, but it’s cheap and environmentally friendly. Because we want to pay off six figures of debt very quickly, we take an extreme approach to frugality. We have a spending ban on most non-essential items, date nights, and outings with friends. Instead of going to a movie or grabbing dinner, we’ve found free things to do for fun. We go to free yoga classes, go for walks/go hiking, have board game nights, and check out free events. We’ve also found ways to reduce the amount we spend on essential items. For example, I shop at cheap stores like Walmart or The Dollar Store whenever possible, and I use coupons and money saving apps. When we first began our debt payoff journey, our debt load was enormous in proportion to our income. For that reason, we needed to find ways to make extra money on the side. My husband has done freelance graphic design and web design projects, and he has also worked as an assistant/second shooter for a wedding photographer. I earn extra income through blogging (mainly with sponsored posts and affiliate marketing). We’ve also looked into some other options for side hustles, such as pet sitting and driving for Uber. Paying off six figure debt isn’t easy, but it is simple. It’s a matter of increasing income and reducing expenses. The strategies described above have allowed us to do both. There have been challenges along the way, but it will definitely be worth it when we’re 100% debt-free! 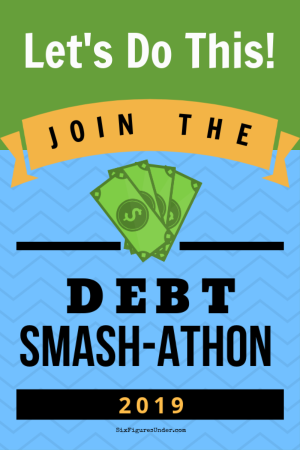 What strategies are you using to payoff your debt? Jen is an HR/finance professional and frugal lifestyle blogger. She shares her journey toward shedding 50 pounds and $117,000 of student loan debt on her blog Frugal Millennial. I love a good story about making it to the other side of debt, also. We currently have only debt from mortgage so we continue to plug away at that. I just started blogging so will see where it goes. Also, renting that room is so smart! Thanks Jennifer! Best of luck with blogging and with paying off your mortgage!